What happens when you take a talented cast & mix their comedic talents with animation? Drew Carey's Green Screen Show! To view this website, you must have the latest version of Macromedia Flash Player installed. Download it for free here. This site was created in July 2003 and is not affiliated with ABC, Hat Trick Productions, Warner Bros, or the stars of "Whose Line?" & "Green Screen." Any emails that you send from this site will not be seen by any of the people or companies above. screen (like the one used in the WLiiA game "Newsflash") with a live studio audience and in post-production, a company called Acme Filmworks adds a variety of animations in both the background and foreground. The actors will even be able to interact with the animations. For example, if someone is drinking a beer at a bar, the performers will be placed in a bar and the drink will be put in their hand. Fans need not worry about the animations playing too much of a role in the show, as Executive Producer Robert Morton has promised that the comedy will remain their first priority and main goal. According to Drew himself, all it takes is for you to watch "Drew Carey's Green Screen Show" one time and you'll be hooked. This innovative series is no doubt a fun and exciting adventure for everyone! "Green Screen" completed its first season order of 12 episodes on Comedy Central, but, unfortunately, it is not expected to be renewed. 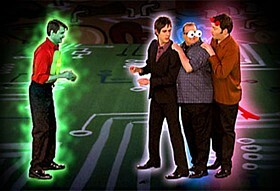 For news & updates regarding "Green Screen" visit the main page of "Whose Line?" on DVD Campaign Central!